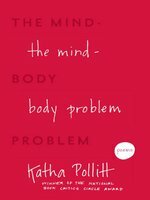 In The Mind-Body Problem, Katha Pollitt takes the ordinary events of life–her own and others'–and turns them into brilliant, poignant, and often funny poems that are full of surprises and originality. Pollitt's imagination is stirred by conflict and juxtaposition, by the contrast (but also the connection) between logic and feeling, between the real and the transcendent, between our outer and inner selves: Jane Austen slides her manuscript under her blotter, bewildered young mothers chat politely on the playground, the simple lines of a Chinese bowl in a thrift store remind the poet of the only apparent simplicities of her childhood. The title poem hilariously and ruefully depicts the friction between passion and repression ("Perhaps / my body would have liked to make some of our dates, / to come home at four in the morning and answer my scowl / with 'None of your business!' "). In a sequence of nine poems, Pollitt turns to the Bible for inspiration, transforming some of the oldest tales of Western civilization into subversive modern parables: What if Adam and Eve couldn't wait to leave Eden? What if God needs us more than we need him? 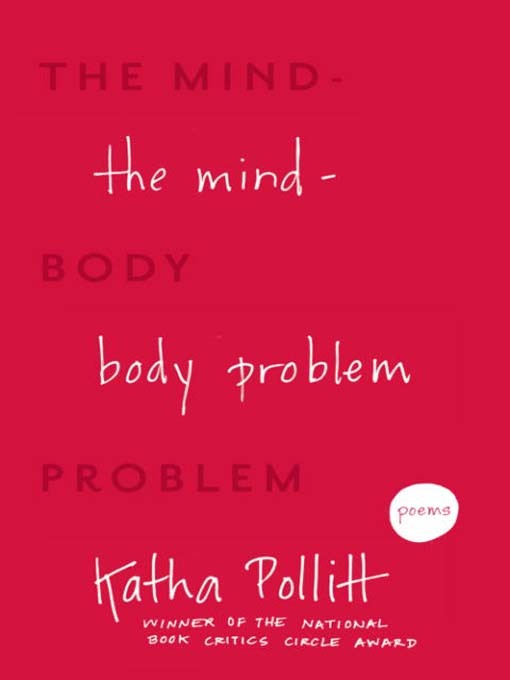 With these moving, vivid, and utterly distinctive poems, Katha Pollitt reminds us that poetry can be both profound and accessible, and reconfirms her standing in the first rank of modern American poets. wept in church or refused to go at all. Their mothers saw right away no man would marry them. but given to outbursts of pride that embarrass everyone. and when I woke I knew I was in Hell. of writing down the secrets of her heart." but today wild geese fly south over ruined towers. do you see us now, scattered on distant shores? Katha Pollitt is a poet, essayist, and columnist for The Nation. She has won many prizes and awards for her work, including the National Book Critics Circle Award for her first collection of poems, Antarctic Traveller; two National Magazine Awards for essays and criticism; and fellowships from the Guggenheim and Whiting foundations. She is also the author of Learning to Drive: And Other Life Stories and Virginity or Death! : And Other Social and Political Issues of Our Time. She lives in New York City. (1982) won the National Book Critics Circle Award. Twenty-seven years later, this second collection shows her fine ear and eye, urbane tones, attention to the ups and downs of middle age and motherhood, and her debts to Elizabeth Bishop, whose most ardent fans will find Pollitt at her worst derivative, but at her best a wise and worthy heir. “Shore Road” just rewrites Bishop’s “Filling Station” (”somebody/ crew-cuts the crab-grass... puts out the plastic lawn chairs”). Poems about biblical scenes and characters seem thin compared to Bishop’s prodigal son. Yet when Pollitt uses Bishop’s careful and careworn tones for autobiography, she achieves wry, urbane retrospect and a power all her own: “Old Sonnets,” for example, recalls Pollitt’s undergraduate poetic ambitions; “Always Already” considers how the adult writer loses herself in the forest of other works, where “culture is a kind of nature,/ a library of oak leaves,/ muttering their foregone oracles.” No one is likely to call Pollitt’s verse radically new. Yet these poems can rise far above their promptings, as fleeting verse about an urban scene can rise to representative powers: often enough, Pollitt does. Billy Collins, former United States Poet Laureate "At the center of every poem lurks the poet, but Katha Pollitt balances the self-regard of the craft with a fervent interest in the profusion of the world--knickknacks, summer bungalows, dogs, bees, lilacs, mandarin oranges, and more. And her clear, observant eye brings it all into steady focus. This is one long-awaited volume that was well worth the wait." Kay Ryan, United States Poet Laureate "It's awfully good to have such a great-hearted poet as Katha Pollitt take on mortality's darkest themes. Again and again she finds a human-sized crack of light and squeezes us through with her." Richard Howard, winner of the Pulitzer Prize "So much has happened to the world since Katha Pollitt published her debut collection, Antarctic Traveller, in 1982, yet what has happened to her poetry is a fascinating progress of distinction, of steadying insight, and of meditative enrichment. Poems like 'Night Subway' and 'Trying to Write a Poem Against the War' show an undaunted consciousness of this daunting quarter century, but Pollitt's most surprising gift, to be savored only now in poem after poem, is the proof that primaveral raptures were literally premature, that our high middle ages are worth all they cost, that life's truest poetry is in the second half."